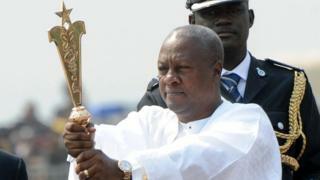 Ghana election: Can 'Mr Power Cut' John Mahama win a second term? Ghana's President John Dramani Mahama has joked he is known as "Mr Dumsor" - a reference to the power cuts that have plagued Ghana during his first term in office. "Dum" means off and "sor" means on in the local Twi language and Mr Mahama has come in for criticism for his inability to tackle the problem - as well as for the ailing economy and corruption scandals. But on Wednesday Mr Mahama is asking voters to disregard such problems and give him a second term. Vice-president under John Atta Mills, the 58-year-old became president when Mr Mills died, before winning the 2012 election by a slender margin. During his "Accounting to the People" tour this year, he sought to convince Ghanaians at home and abroad that he was delivering on his campaign promise of creating more jobs. He said a revamped sugar factory in Ghana's central region would create 7,300 jobs and reduce the bill for sugar imports, which he said amounted to $300m (£237m). He also commissioned a new "Dubai-style" flyover in a busy business district in the capital, Accra, completed last month. However, his National Democratic Congress (NDC) government has not been able to deliver all of the 200 senior high schools it promised four years ago, while the local currency, the cedi, has fallen against the dollar and pound. The Mahama administration has also been hit by major corruption scandals. A major blow to his presidency has been his government's inability to retrieve 51.2m cedis ($11,7m; £9.3m) paid by the government to a ruling NDC party financier, even though the Supreme Court ruled back in 2014 that the payment had been unconstitutional. When the president met Ghanaians in the UK in May, he told them that corruption had to be dealt with in a "more systematic manner" and indicated that he was "working towards a cashless society by 2020". "I'm taking Ghana to the next level," Mr Mahama told the audience. A Christian, Mr Mahama is a respected historian, writer and communications specialist who is known for having a sense of humour. His book, "My First Coup d'Etat", looked at the political problems that have gripped African countries since their independence and was published while he was serving as vice-president. The current president was born at Bole-Bamboi in Ghana's northern region. He spent much of his 20s and 30s studying, including a period in Moscow, and worked at the Japanese embassy in Accra and for the NGO Plan International. He became an MP in 1996 and was communications minister from 1998 to 2000, when Jerry Rawlings was in power, and also served as a member of the Pan African Parliament based in Pretoria from 2004 to 2011, where he was Chairman of the West Africa Caucus.